*KB must be held at chest or higher. *DBs or KBs may be held in the front rack. *Men and women will elevate front foot on 45lb plate. 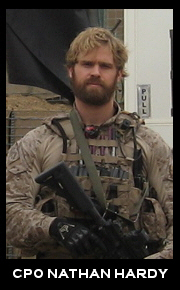 In honor of Chief Petty Officer Nate Hardy, who was killed Sunday February 4, 2008 during combat operations in Iraq. Nate is survived by his wife, Mindi, and his son Parker. *Teams may divide the work however they like.